A new American research has estimated that, out an estimated 1.04 million “premature mortality associated with PM2.5 exposure” per annum, 858,900 (82.5%) premature deaths could be avoided in case the Government of India and state governments implement a 13-point strategy, worked out based on what has been called Community Multiscale Air Quality (CMAQ) model. This would happen by a reducing PM2.5 pollution by 38.7%. 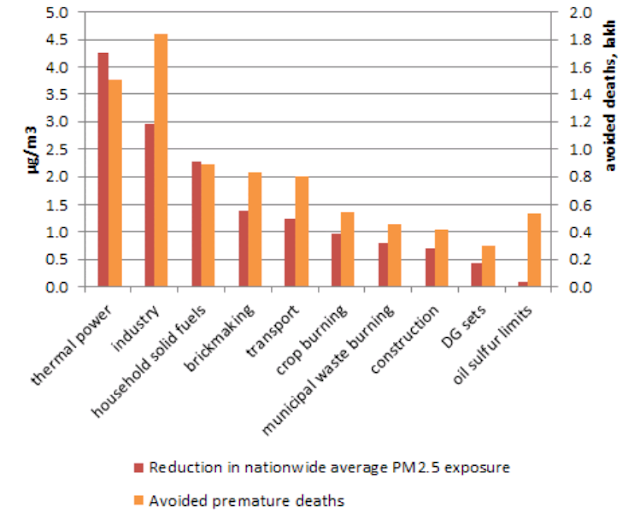 Done by US’ Air-Weather-Climate (AWC) Research Group Department of Civil and Environmental Engineering, Louisiana State University, the study, titled “Source apportionment, health effects and potential reduction of fine particulate matter (PM2.5) in India”, says that "premature mortality associated with PM2.5 exposure was mainly due to cerebrovascular disease (CEV)", the highest (0.44 million) of all other types illnesses in India. This is "followed by ischaemic heart disease (IHD, 0.40 million), chronic obstructive pulmonary disease (COPD, 0.18 million) and lung cancer (LC, 0.01 million), adding up to total morality of 1.04 million", says the study, adding, the "top states" of premature mortality are Uttar Pradesh (0.23 million), Bihar (0.12 million) and West Bengal (0.10 million). Pointing towards the types of air pollutions Indians suffer from, the study finds, "The residential sector was the top contributor (55.45%) to total premature mortality with a concentration of ~ 40 µg/m3 , followed by industrial sources and power plants (26.5%) and agriculture (11.9%)." "Notably, in Delhi, the contribution of power plants and industrial sources exceeds residential emissions", the study says, adding, in case of reduction of the PM2.5 concentrations to 35 µg/m3 , a World Health Organization target, "premature mortality in Uttar Pradash due to PM2.5 exposure would be reduced by 76%." Pointing towards the positive impact of the 13-point strategy, the study says, "The implementation of new emission standards for thermal power plants can avoid 124,000 premature deaths every year and cancelling the construction of proposed coal-fired power plants not yet under construction can avoid a further 26,000 premature deaths." It adds, "A 50% reduction in the use of solid fuels by households nationwide could avoid an estimated 177,000 premature deaths annually, completely abandoning crop burning can avoid 55,000 premature deaths, reducing the use of diesel generators by 90% can avoid 30,000 premature deaths per year." According to the study, "The results show that reducing residential emission from solid fuels combustion and reducing power sector emissions affect PM2.5 concentration most, followed by reducing municipal solid waste burning and new emission standards applying in industry sector." It says, "In scenarios of thermal power plants emission, concentration increased maximum to more than 9 µg/m3 and decreased greatly in part of north India. From results, residential emission reduction could greatly eliminate PM2.5 concentration, followed by implementing new emission standards in the power sector and introducing new emissions standards for the industrial sector." It further says, "New emission standards applied in industry sector affect PM2.5 concentration the most, followed by reducing emissions from existing and new thermal power plants, reducing municipal solid waste burning and reducing residential emission from solid fuels combustion and diesel generating sets use." "Concentrations of PM2.5 were highest in the Indo-Gangetic region, including northern and eastern India. PM2.5 concentrations were higher during winter and lower during monsoon season", the study says, adding, "Winter nitrate concentrations were 160-230% higher than yearly average." The study points out, "Except in southern India, where sulfate was the major component of PM2.5, primary organic aerosol (POA) fraction in PM2.5 was highest in all regions of the country. Fractions of secondary components were higher on bad days than on good days, indicating the importance of control of precursors for secondary pollutants in India." Have you heard of Mahul in Mumbai? When a government cannot decide what to do when the damage is in front of them--now the water and air quality is going to be tested and never mind the people, including children, who are dying or dead--do you think anyone is going to bother about some (to them) theoretical damage to some vague "thing" called environment? It's an education ; but frightening all the same . Every citizen should make their contribution .